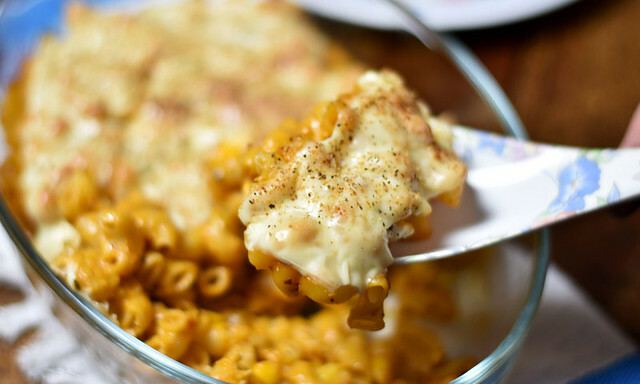 Baked Mac and Cheese with Corn in a healthier avatar of our regular Mac and Cheese recipe. I am sure it will sound interesting if you are like healthier recipes. Yes, this is my healthier twist to the regular baked pasta recipe. 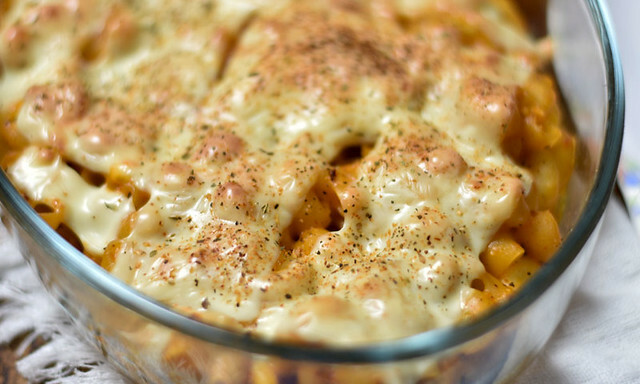 This amazingly easy Mac and Cheese Macaroni recipe make a perfect dinner. People who read my blog or follow my recipes, they know well that I cannot simply follow any recipe until I give it my touch :). And I love it that way. The internet is already flooded with similar recipes but my recipe is not going to be a sheep in the flock. Continue reading if you like to know how I make this recipe much healthier than ever. Mac and cheese recipe is generally made with all-purpose flour macaroni shells and loaded with cheese. 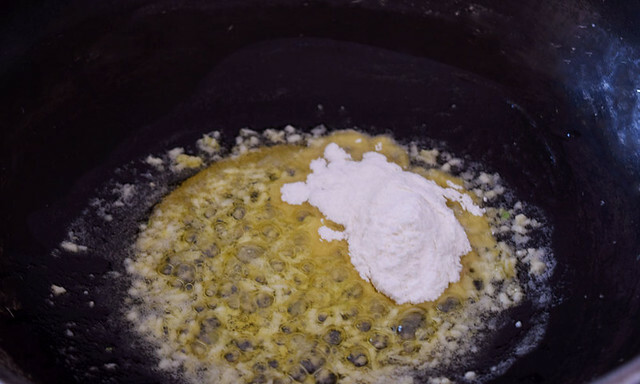 Moreover, all-purpose flour is used to make the pasta sauce. Yes, yes follow along to see what gets replaced with what for my healthy baked mac and cheese with corn recipe. The ingredients you need for this recipe are easily available in the kitchen. Because this is the healthier version of regular Mac and cheese recipe so we will replace all-purpose flour macaroni shells with semolina based macaroni shells. We will also replace all-purpose flour with whole wheat flour to prepare the sauce. 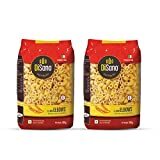 Don’t worry, there is no compromise with the final taste of our macaroni pasta recipe but replacement of ingredients shall make the recipe guilt free. While at one side you will satisfy your taste buds, on the other side you will be pouring in some nutrition in your body. As a first step, in a large vessel take 1-liter water and start heating it. Add macaroni shells to it and Stir it. Boil macaroni for about 8-10 minutes (until half done). Then remove the cooked macaroni from heat and drain the water. Rinse it with cold water to stop further cooking of it. Washing it with cold water also prevents sticking of the shells. I have curated the list of recommended tools and ingredients for baking. I recommend only tried and tested products that have given satisfactory results in my kitchen. Now, in a large pan melt butter over medium heat. Add minced garlic to it and sauté for 1 min. Add wheat flour and cook for 3-4 minutes or until there are no lumps of raw flour. Keep stirring the mixture constantly to avoid over-cooking. Once flour is roasted well, add milk to the mixture and using a whisker, whisk it to avoid lump formation. Few people are comfortable in doing this process with spatula however I feel whisker gives better results. I always get smooth and creamy sauce without any lumps. Continue to stir until mixture is smooth and thicken enough to coat the back of the spatula. Add all the dry spices like chili flakes, salt, black pepper, and mixed herbs along with the pizza sauce. Stir everything and cook for another 1 minute. Remove the pan from the heat. Our Pasta sauce is ready. Because I am making a healthier version so I avoided adding cheese to the sauce. 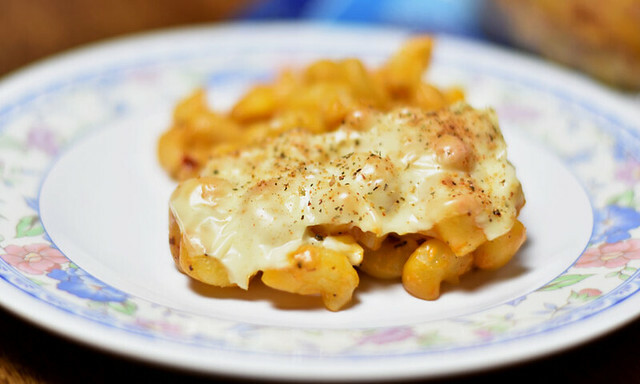 But if you like your macaroni loaded with cheese then along with all the spices add ½ cup grated cheddar cheese. Adding cheese is completely optional. Add half cooked macaroni shells and corn to the prepared sauce. Mix everything to incorporate sauce into macaroni. 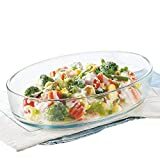 Take an oven-safe glass bowl. If you are going to use any other tin/tray then make sure to grease the tin/tray with butter. As I have used a glass bowl so need of grease. Meanwhile, keep your oven for preheating at 200 °C. 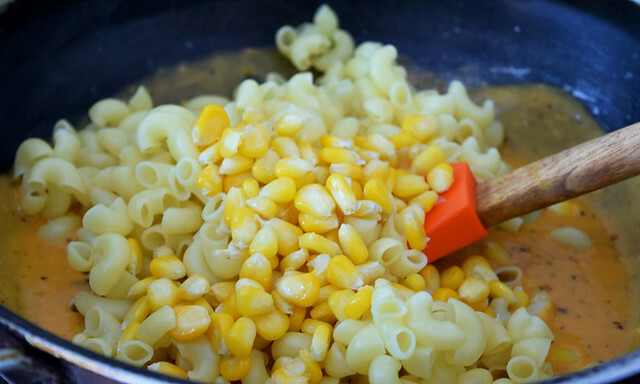 Pour the prepared Cheese and corn Macaroni into the bowl. Cover the Macaroni with slices of processed cheese. Bake this in a preheated oven at 200 °C for 10 minutes. After 10 minutes, take the baking tin out from the oven. Our Baked Mac and Cheese with Corn are ready. This tastes awesome when hot. My family loves to have this macaroni pasta with a slice of homemade garlic bread. In case you left with some pasta, though chances are rare, then also nothing to worry. Just store it in the refrigerator and before serving it just cover the bowl with aluminum foil and in a preheated oven bake it for 10 minutes on high at 200 °C. It will taste as fresh as you have just prepared it. This trick works well in case you want to serve baked mac and cheese with corn to your guests in the party. If you like this recipe, then please subscribe to our YouTube Channel for my video recipes. You may also find me on Twitter, Instagram, and Facebook. Best Baked Mac and Cheese with Corn Macaroni Pasta Recipe. 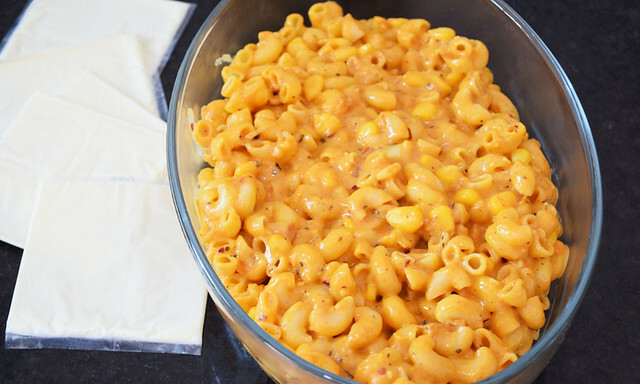 This amazingly easy Mac and Cheese Macaroni makes a perfect dinner. In a large vessel take 1-liter water and start heating it. Add macaroni shells to it and Stir it. Boil macaroni for about 8-10 minutes. Remove the cooked macaroni from heat and drain the water. Rinse it with cold water to stop further cooking of it. In a large pan melt butter over medium heat. Add minced garlic to it and sauté for 1 min. Add wheat flour and cook for 3-4 minutes. Keep stirring the mixture constantly to avoid over-cooking. 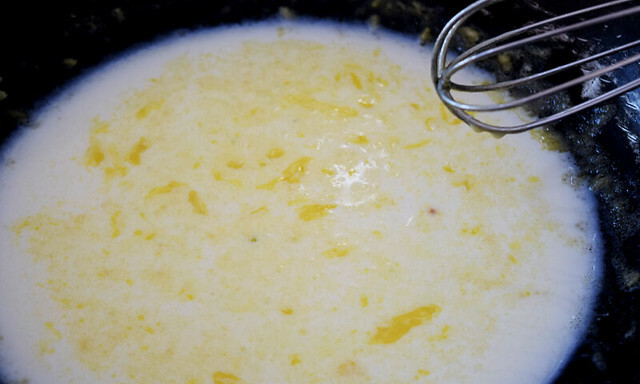 Add milk to the mixture and using a whisker, whisk it to avoid lump formation. Continue to stir until mixture is smooth and thicken enough to coat the back of the spatula. 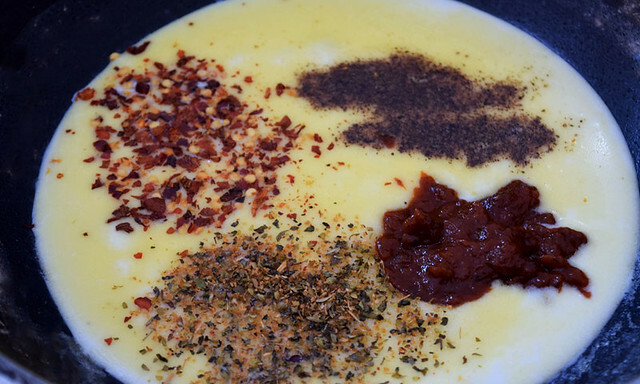 Add all the dry spices like chili flakes, salt, and black pepper, mixed herbs along with pizza sauce. Stir everything and cook for another 1 minute. Add half cooked macaroni shells and corn to the prepared sauce. Meanwhile, keep your oven for preheating at 200 °C. 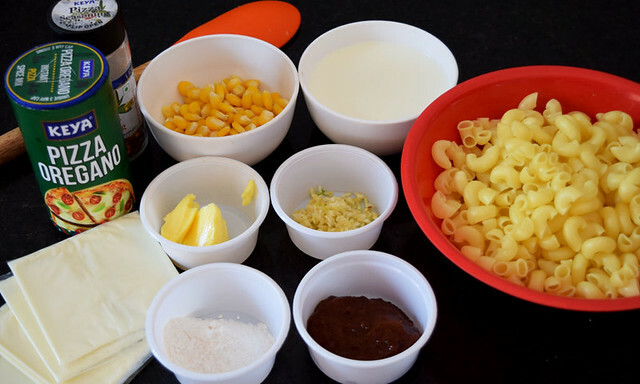 Pour the prepared Cheese and corn Macaroni into the glass bowl. 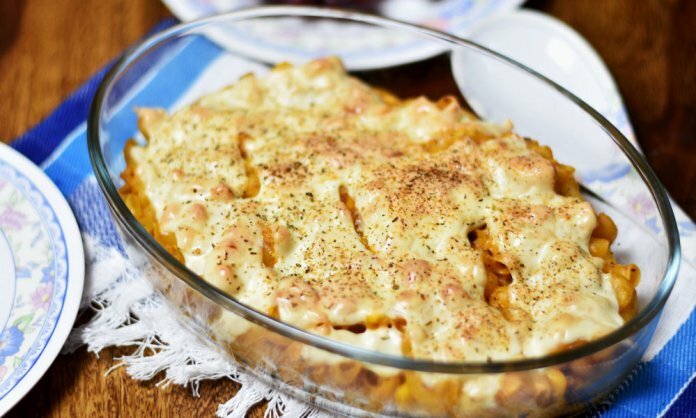 Cover the Macaroni with slices of processed cheese. Bake this in a preheated oven at 200 °C for 10 minutes. After 10 minutes, take the baking tin out from the oven. Our Baked mac and cheese with corn is ready. To make it cheesier add grated cheddar cheese while making the sauce. If you want to make it with white sauce then skip adding pizza sauce. Do not overcook the pasta else it will not taste good. Choice of vegetables is up to you. You can add broccoli and olives. Instead of making it with butter, you can cook it in olive oil. Next articleWhy Is Baking Healthier? As usual, healthy version of a yummy treat.. Thanks a bunch for posting this. One quick question – what are the mixed herbs that you have used here please? Very different Sonia. I never tried corn in mac and cheese. You must try this. Kids at my place vanished it so quickly that I could not even capture more images of it. Ooooh! I love the addition of corn in this mac and cheese! It sounds delicious!